Pune(PTI): Bullock cart owners today blocked the Pune-Nashik Highway near Chakan here demanding lifting of the ban on bullock cart races in Maharashtra. They also sought a ban on the People for the Ethical Treatment of Animals (PETA), an NGO which has been campaigning against such races. The blockade disrupted traffic on the busy highway for three to four hours. The Bombay High Court on October 11 refused to lift its ban imposed on bullock cart races in Maharashtra. 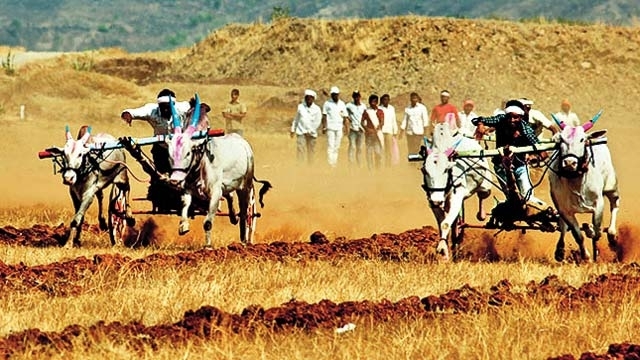 The order came ahead of Diwali festivities when bullock cart races are organised across the state. “The Maharashtra government passed a bill to resume bullock cart races and the President of India, too, approved it. However, a petition was filed against the bill in the High Court and the court banned bullock cart races,” said Ramkrushna Takalkar, an office-bearer of the All India Bullock Cart Owners’ Association. “Several cases have been registered against the PETA in other countries as they are involved in malpractices. We demand that government ban the PETA and initiate an inquiry against it,” he said. He said the state government should approach the Supreme Court and put forth their side strongly so that the ban on races is lifted. The `rasta roko’ (road block) disrupted traffic on the highway near Talegaon Chowk for three to four hours. Police detained several members of the association and leaders, including Shirur MP Shivajirao Adhalrao Patil, MLAs Mahesh Landage and Suresh Gore, and several others. They were later released. near Chakan here demanding lifting of the ban on bullock cart races in Maharashtra.